This update focuses on fixing multiple user interface issues, mostly related to the media player. Libraries were updated, a nasty freeze when opening FrostWire out of a magnet link has finally been fixed, and new linux collaborators have given some love to our codebase. 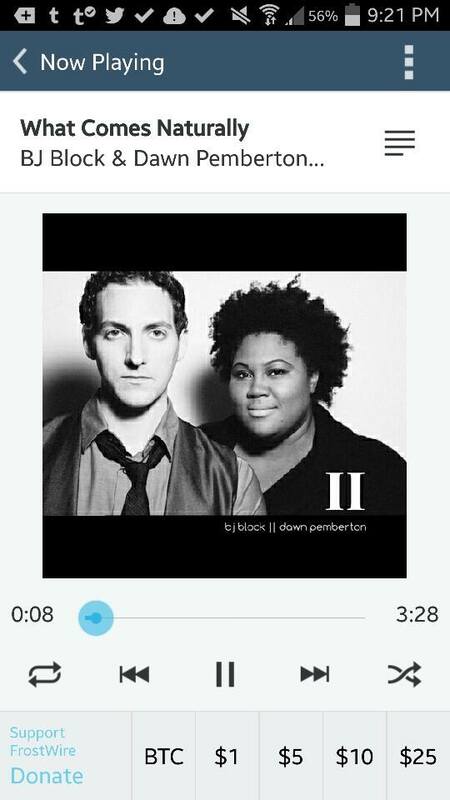 by long pressing the Play/Pause player button. FrostWire now has a new feature in which it tries to detect wether or not you are using a VPN connection to warn you about the possibility of your privacy being at risk. We recommend that whenever you are online you connect to the internet using an encrypted VPN connection to protect your identity and your privacy. If you are a developer/translator/graphic designer, you should know that now you can earn bitcoins when your patches and contributions are merged to the master branches of our open source projects on github. You will automatically receive Bitcoins in your Bitcoin wallet, you just need to have a github account and a tip4commit account where you can register your Bitcoin wallet address. Payments are sent within minutes of your patches being merged. 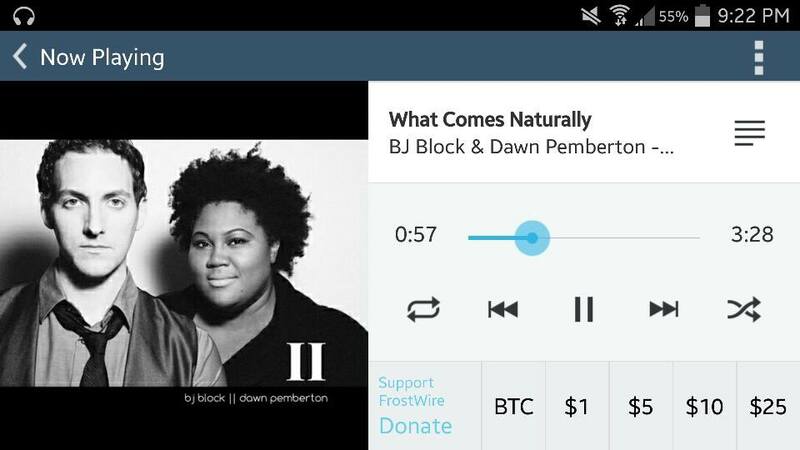 FrostWire Bitcoin donations are being diverted into our main open source projects frostwire-desktop, frostwire-android, frostwire-common and frostwire-jlibtorrent. Each merged commit gets 1% of what’s left on each fund. We are hard at work on the next generation of FrostWire 6, if you paid attention to the names of our repositories, or if you follow this blog, you may have read about the frostwire-jlibtorrent project. We have made a full featured Java wrapper API out of the C++ libtorrent library and the results of our tests have been phenomenal. We’re currently replacing all of our Bittorrent core for one that uses libtorrent and we’re pretty sure you will feel the difference. 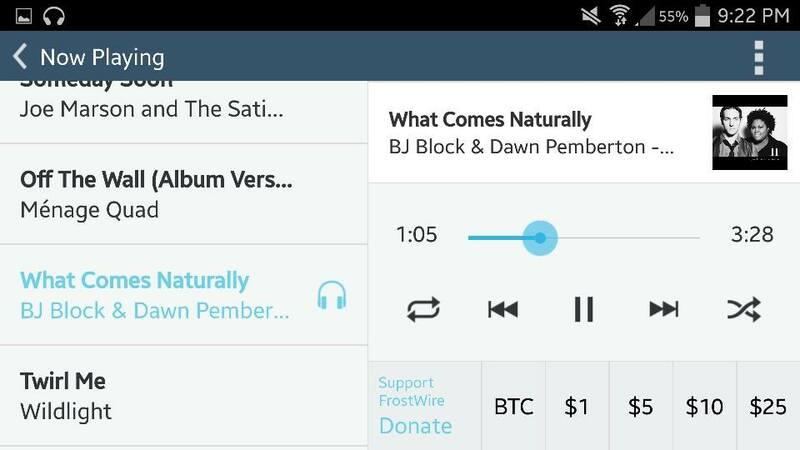 Join the FrostWire Beta Testers group to help us release a steady FrostWire 6. * New: VPN connection status indicator. * New: Stop media playback by long pressing play/pause button. clicking on a magnet link or .torrent file. * Fix: Bug where files couldn't be played with the main player button. after the media player had stopped. dialog were not visible unless the window was resized. not be set. Thanks @foutrelis. an MPlayerWindow that may have not been instantiated. 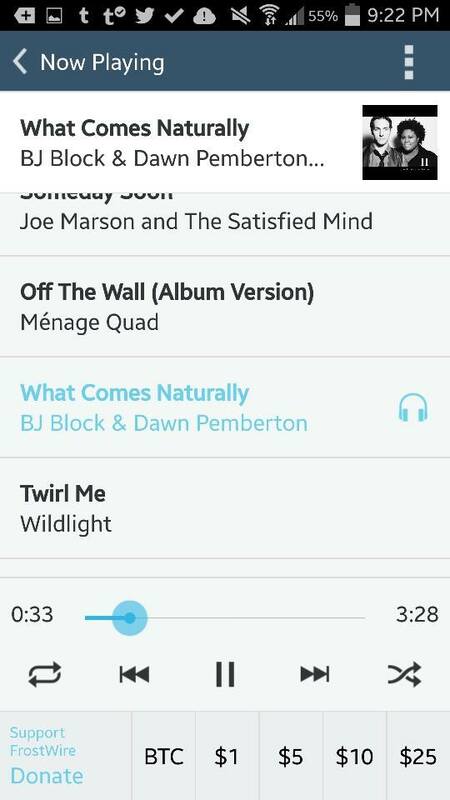 Here’s a few screenshots of our upcoming Android update, now featuring a full featured music player which sports a lot of new features, including Lock Screen Integration, notification window integration, gestured based skipping/pausing/resuming/stopping, playlist viewing, horizontal layouts and more. In Geek speak, here are the full changes for FrostWire 5.5.4, released on Thursday, Feb. 21 2013. * New Feature: extract audio (.m4a) from (.mp4) videos on right click. * New Core Feature: HTTP resumeable large transfer support. * Upgrade: 'Repeat song' playback mode now available. shortcuts to content creator's social media channels/streams. * Upgrade: binary compatibility improved for Windows releases. * Bug fix: several crashes and errors fixed.